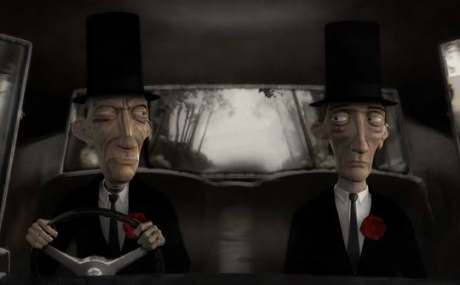 Britain’s nominee for possible Oscar glory in the short animation category this year is This Way Up, a lovely little Edward Gorey-esque dark comedy of a father and son undertakers attempting to bury a little old lady after an unlikely accident sees the hearse flattened with a boulder, taking them struggling across country with the coffin and then into the Afterlife in their quest to finish the job, all performed without words. For a change instead of just reading about it or seeing a clip we can actually watch the entire short animation on the BBC’s Film Network site (the Beeb part funded the film by Nexus’ Adam Foulkes and Alan Smith). While you’re there have a poke around the rest of that site because the Beeb have some other animation and other short film gems there (I’m not sure if it is geo-locked to only play for folks with UK ISPs or not though and you will need Windows Media Player or Real Player to watch it). I was posting about the short animated film winner at last night’s Oscars on the FPI blog earlier today and being the nosy bugger I am I had a look for something online so I could point readers to where they could check out a bit of the film, but couldn’t see much more than a very basic website for Mikrofilm. 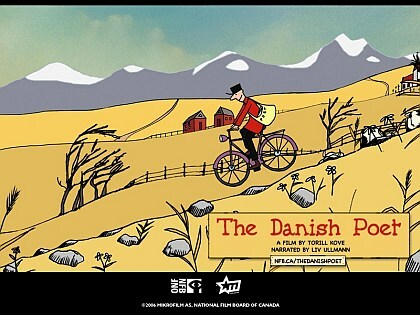 So I dropped them a line and heard back very quickly from a very nice lady called Lise there who sent me a link to this fetching site where you can have a look at the (now Oscar winning) Danish Poet by Torill Kove, with narration by Liv Ullman, with a clip and various other snippets of this quite gorgeous looking animation (I thought the art reminded me of a cross between children’s picture books and Metaphrog’s lovely Louis comics). On the other end of the Oscar scale how brilliant is it that Martin Scorcese was finally awarded the Best Director Oscar? Ironic that it isn’t actually for his finest work which the Academy didn’t recognise in previous years, although The Departed is still a damned fine movie (right to the end which I didn’t see coming), but given they have overlooked him for decades and he is pretty much the greatest living American director (and still working) it is amazing he has been so overlooked by Oscar for so long. Thank goodness they finally gave it to him; I was worried Marty was going to end up with one of those ‘lifetime achievement’ awards which usually mean the recipient has about a year to live – those things are the kiss of death :-).